This painting, a complete invention of a mythic place of ancient sacrifice to a lost god, borrows an idol from Easter Island, thousands of miles to the east, and death’s-heads from Maori body decorations, thousands of miles to the west. Gauguin's first trip to Tahiti in 1891 marked the end of a difficult period in his career, one fraught with financial difficulties and marred by the death of his friend Vincent van Gogh. A trip to the South Seas offered the possibility of escape and a tropical paradise in which to reinvigorate his flagging painting career. Gauguin's Tahitian paintings were received coolly when they were exhibited in Paris on his return in 1893, but today they are regarded as magical works layered in myths of his own invention. This painting shows a marae, or sacred enclosure, in the Marquesas Islands. Gauguin's original title for the work---There is the Marae (Temple of Prayers and Sacrifices)---alludes to the legend that children were sacrificed there, but the setting is a fanciful creation of the artist, who assembled it from diverse objects. An idol similar to those from Easter Island, five thousand miles from Tahiti, stands alone on a hill, while a fence enclosing the sacred space is decorated with skulls and patterns inspired by the ear plugs worn by Maori women two thousand miles to the west. The picture's exotic subject is matched by an appealing use of tropical flora, bright colors, and flattened forms worked with hatched brushstrokes. Jennifer A. Thompson, from Masterpices from the Philadelphia Museum of Art: Impressionism and Modern Art (2007), p. 92. Gauguin was a cheat and liar and an all-around cad. He was also a very great genius who took, or actually forced, French progressive painting to a new level of experimental invention, all the while creating a mythology about himself--the savage rebel--and a place--Tahiti and the South Seas--that has withstood debunking for over a hundred years. Gauguin made his first trip to Tahiti in 1891, but soon retreated, sick and broke, back to Paris, where he showed this and other Tahitian works with little success. With time, however, came public awareness of the great imaginative power of these paintings, which arises from the magical world Gauguin invented after his encounter with a truly exotic (and slightly scary) civilization. 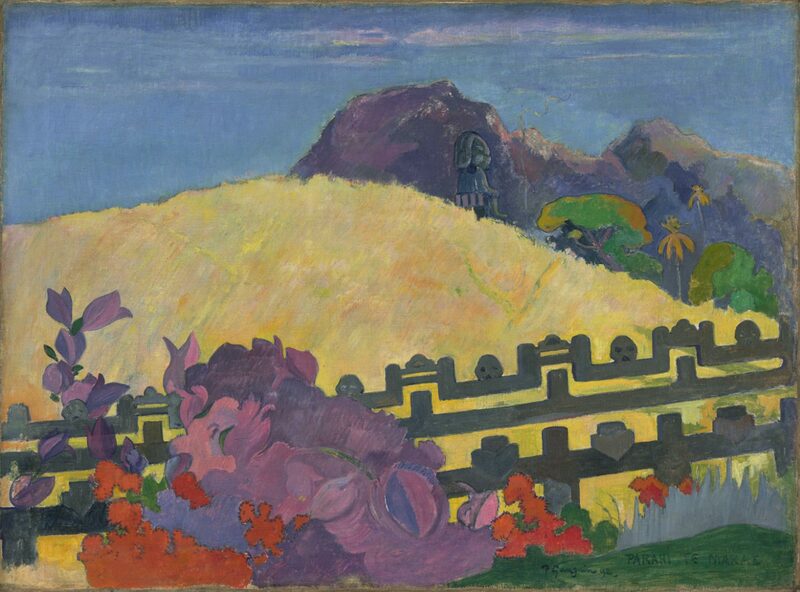 Here, although the fence with its decoration of skulls, the idol on the hill, and the evocation of sacrifice in a thread of smoke ascending before the demanding god have no basis in Tahitian culture, Gauguin has created another kind of paradise in the opulence of his color and the splendid sensuality of his images. Joseph J. Rishel, from Philadelphia Museum of Art: Handbook of the Collections (1995), p. 208. Sale, Gauguin, Hôtel de Ventes, Paris, February 18, 1895, no. 26, bought in by Gauguin . Sale, Paris, Hôtel Drouot, June 16, 1908, no. 28; purchased by Ambroise Vollard (1867-1939), Paris, until at least 1936 ; sold to Étienne Bignou and owned jointly by Bignou Gallery, Paris and New York, and Alex Reid & Lefèvre Galleries, London, by January 1939 to 1940 ; with Étienne Bignou, Paris; sold by Bignou Gallery, New York, to Rodolphe Meyer de Schauensee, Devon, PA, January 27, 1940; gift to PMA, 1980. 1. Of the 47 paintings in the sale, all but 9 failed to sell and were bought in by Gauguin. J. de Rotonchamp, Paul Gauguin (Paris, 1925, p. 155) and the Wildenstein catalogue raisonné (Paris, 1964, no. 483) state that the painting was purchased by Gauguin's friend Émile Schuffenecker; however, the procès-verbal of the sale records that the painting was bought back by Gauguin (see Gauguin: Exposition du Centenaire, Paris, Orangerie des Tuileries, 1949, catalogue by Jean Leymarie, app. II, p. 97); Gauguin used various friends as figurehead buyers at the sale. Moreover, Leymarie (app. III) reprints a letter written by Gauguin shortly after the auction to an unknown recipient, offering several paintings including "The Sacred Mountain" at the catalogue prices. 2. Vollard exhibited the painting in 1910-11 at the Grafton Galleries, London and in 1936 at an exhibition organized by the Gazette des Beaux Arts, Paris. 3. Exhibited New York, Bignou Gallery, "Gauguin, First Trip to Tahiti," January 3-14, 1939, no. 2, and London, Lefevre Galleries, "Milestones of French Painting," June 1939, no. 14. According to letters from Alex Reid & Lefèvre and Lefevre Fine Art dated 10 May 1965 and 26 Feb. 2004 (curatorial file), the painting was purchased by Bignou directly from Vollard, was then owned jointly with Reid & Lefevre, and sold by Bignou.